Evaluating presidents on the merits of whether their policies promoted peace, prosperity, and liberty, this ranking system takes a distinctly new approach. Historians and scholars have long tended to give higher rankings to presidents who served during wartime, were well spoken, or exceeded in expanding the power of the executive office. However, this new examination cuts through these longstanding biases and political rhetoric to offer a new nonpartisan system of ranking that is based purely on how well each president's policies adhered with the founders' original intention of limiting federal power in all its aspects. 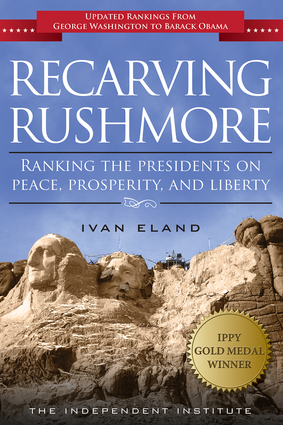 As a result, the book provides an alternative history of the United States as seen through the founders' likely vision of subsequent presidential actions. These presidential rankings will surprise most and enlighten even acknowledged experts on the presidency. Ivan Eland is a senior fellow and director of the Center on Peace & Liberty at the Independent Institute, a former director of defense policy studies at the Cato Institute, and a former principal defense analyst with the Congressional Budget Office. He is the author of The Empire Has No Clothes, No War for Oil, Partitioning for Peace, and Putting Defense Back Into U.S. Defense Policy. His work has been featured in numerous publications, including the Chicago Tribune, the Northwestern Journal of International Affairs, and the Washington Post, and on television programs such as ABC's World News, CNN's Crossfire, and various Fox News shows. He lives in Washington, DC.